When Long Winter returned to The Great Hall on Nov. 8, it came too with the suggestion that audiences would receive a different version of the monthly melting pot-facilitating evenings than they might have come to expect from it last year. To wit, the one reliable feature Long Winter regulars have become familiar with is the dependable lack of predictability tied to each night of the season spanning (and extending) arts and culture community event, but the first night of this season came with a significant rebranding. Ushered into fruition just one year ago by Mike Haliechuk and Josh Zucker of ever-enterprising Toronto punk outfit Fucked Up, the monthly night of music, art, food, film, poetry, photography, dance, speakers, and (eventually) video games began as something that would allow Haliechuk and Zucker to program a local event. Throwing each of the nights to impressively broadened masses as all-ages, pay-what-you-can affairs, Long Winter established itself as a beacon for fairly accessible multi-media entertainment programming (unfortunately the Great Hall is only accessible by stairs; there is no elevator service), and as the events snowballed in scope as well as popularity, its varied offerings came to tessellate more and more of the rooms and hallways that make up the building accordingly. 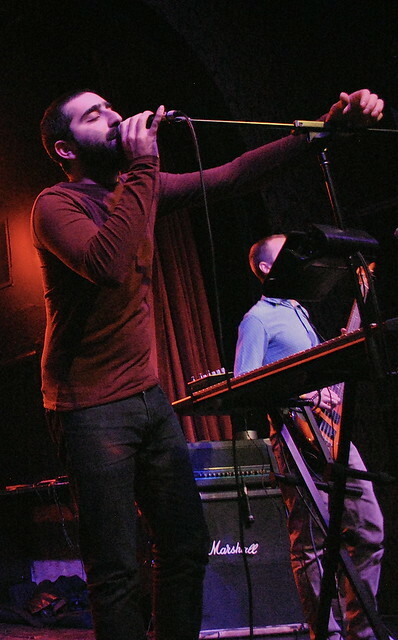 The events relied on the somewhat small community of connections their band had both established and immersed itself in, and Fucked Up headlined most of the five shows, appropriately cited on Long Winter programs, posters, and online event pages as the force that “presented” each of the series’ instalments. 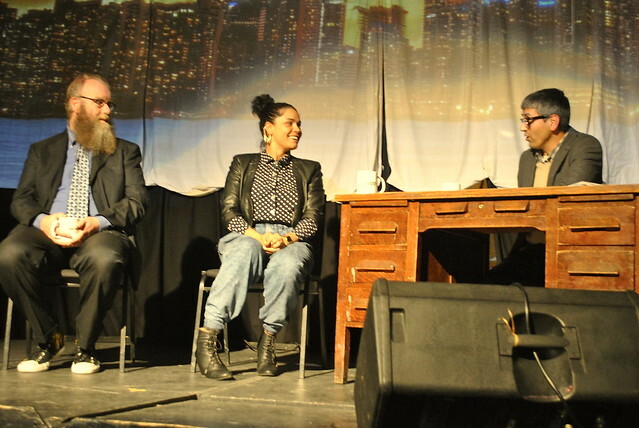 But as it returned this year with the support of the City of Toronto through the Toronto Arts Council, although Haliechuk and Zucker continue to run the show, Fucked Up’s name was nowhere to be found. Speculation could go on forever as to why the band’s pedigree has been removed from the ephemera surrounding the series, but in terms of the void they left to be filled by another headliner – this time a slot arguably shared by psychedelic Guelph rock veterans King Cobb Steelie in the main hall and siblinged Toronto/Montréal darkwave trio Doomsquad in the newly Long Winter-dominated Samuel J. Moore restaurant on The Great Hall’s ground level – it’s worth noting that the series’ website includes a statement from Haliechuk boasting a commitment to diverse programming and calling for outside submissions. “Everyone is welcome, and everyone who attended last year should feel as much a part of this event as we do. We aim to be a reflection of all the great things that people do in Toronto,” Haliechuk says – emphasis on the “all,” no doubt. It would be no great surprise if Fucked Up’s reduced identity were implemented in favour of that virtue. 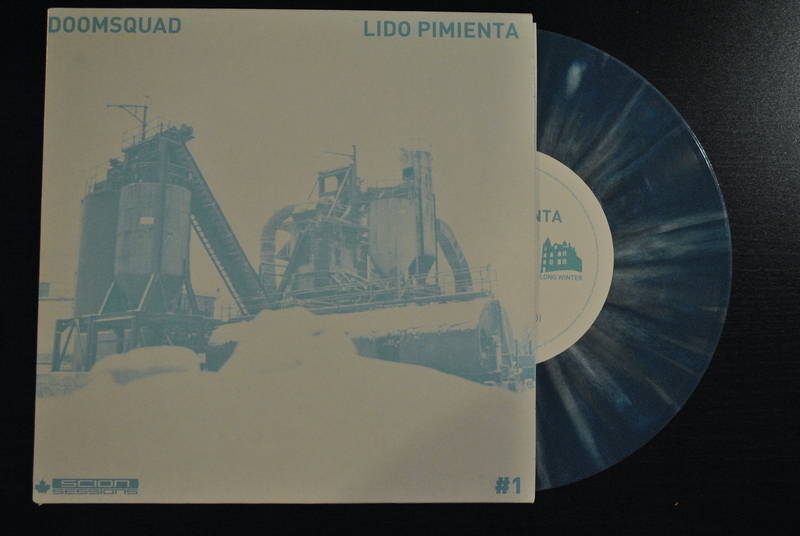 The first 350 patrons entering November 8’s Long Winter would have immediately noticed one other big change as they passed through the doors, each of them granted a free split seven-inch featuring Doomsquad and Lido Pimienta, whom also performed that night. 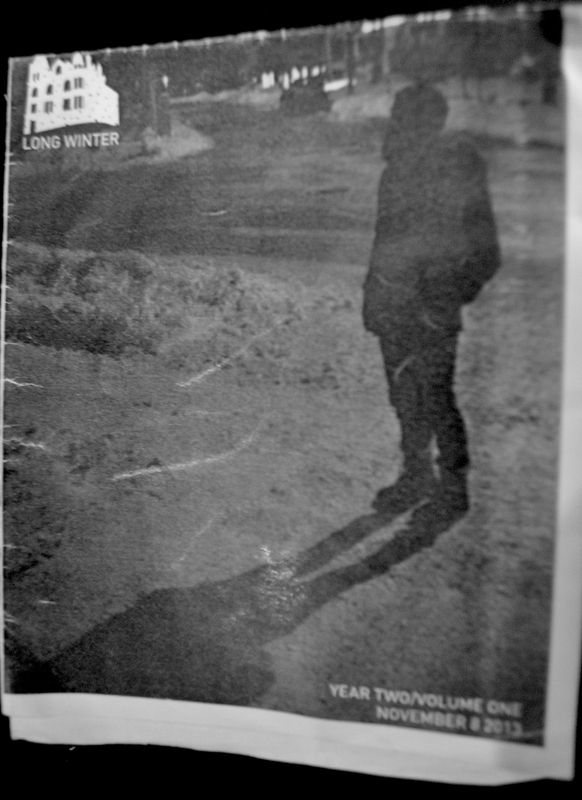 Contributed by the Hand Drawn Dracula-courting Scion Sessions, the record was the first of a series of Long Winter artist-featuring splits slated to be offered to guests for each of this year’s instalments. From there on, though, it was mostly business as usual for one of Toronto’s most immersive entertainment programming series: there was music, there was art, there was food, there was theatre, there was comedy, there were video games, and there was music. Did I say there was music? If guests ventured further upstairs to the hall’s balcony level and coat check, they would have approached and become a part of Steve Reaume’s art/light installation projecting some truly debilitating algorithmic patterns into a corner, and once they’d recovered from the dizzying effects of that, there was William Andrew Finlay Stewart’s “Fall” – a looping video project – waiting for them on the ground. If you skipped dinner to get there early or just wanted some late night munchies, the main hall hosted all-vegan food offerings from Windowshade Delicatessen, who’s reuben sandwich variant will certainly earn their west College street location a personal visit from myself and everyone else I successfully peddle it on. At any given point throughout the night you could also fill your time by drawing on (and having your picture taken with) one of 1078 disposed coffee cups with “Disposable,” a consumption-considering interactive installation from Anrea Wrobel and Brian Cauley. Things really got rolling with Wake Island, though. Opening up the multi-stationed concert portion of the night in the main hall, the Montreal rock foursome hammered things home with some expert delivery, cementing its set as something other performers should have worried about following with guitarist Nadim M’s final tooth-picked solo. Nevertheless, performer Ben Kamino took the stage once they’d finished, instructing the main hall to slow-dance eyes shut in a herd, urging participants to touch each other – not just with their hands but with all parts of their bodies – and by extension, “everyone in the universe.” You can imagine how that went. It was awkward. Kamino repeated this experiment twice more following bands in the main hall. 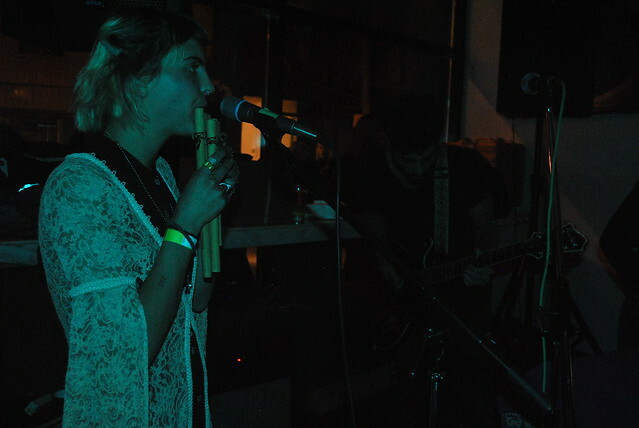 Next was Guelph garage rock act Esther Grey, warming up the Conversation Room. Bringing sometimes-member and saxophonist Dan Paille in tow, guitarist Steph Yates and bassist Nathan Campagnero’s plodding progressions were juxtaposed with some extra texture that I didn’t get to hear when I last reviewed them for their Kazoo! Fest show back in April. Paille’s sax is presented pretty sparingly in comparison to the core group’s output, so it works with the group’s minimalist explorations of instrumental spacing. 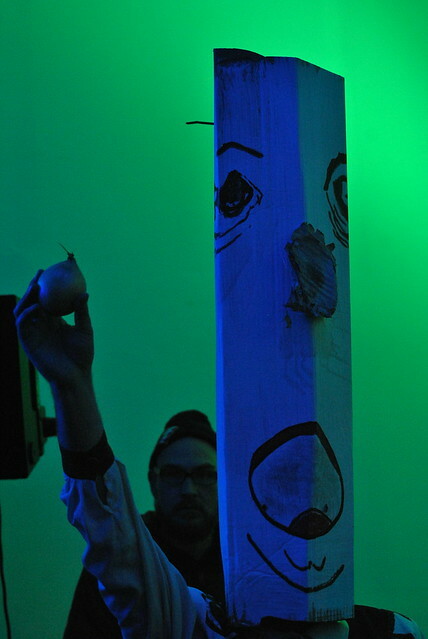 Fixed with elongated cardboard masks, Ben Kamino and Matt Kelly ambushed the crowd remaining in the room at the end of Esther Grey’s set with a guerilla theatre performance called “Conflict. Resolution. Conflict.” Their characters mostly just argued over an onion, but eventually they made up with a sweet(?) embrace that saw them sharing bites out of the very real, very potent vegetable and then scuttled out of the room. Recovering from Kamino and Kelly’s adventure in Beckettian theatre and wandering back into the main hall, Rheostatics founder Dave Bidini’s new group Bidiniband guided audience through a literary-minded tour of rock history, only playing four stream-of-conscience-y “long ones” to negotiate the restraints of their set time. If you rushed from Bidini’s set to the conversation hall, you would have caught a very confrontational Abyss, whose frontman spent the majority of the group’s grindcore assaults sharing the mic with one listener’s face, whether he liked it or not. 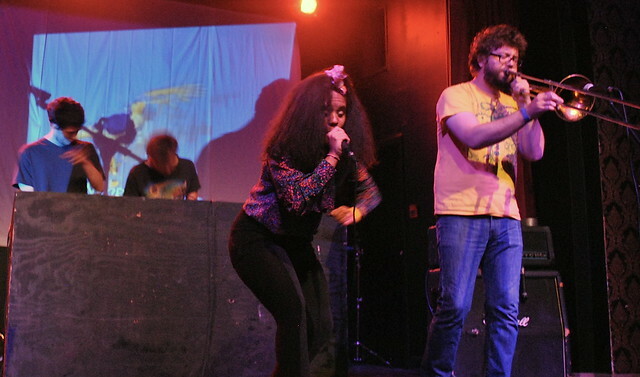 Next up in the main hall was Lido Pimienta, who should really get props for exacting some very hands-on parenting all while singing and dancing onstage. “Single mothers in this city are gangster, y’all,” Pimienta said. She proved she wasn’t wrong with her highly danceable genre-benders. 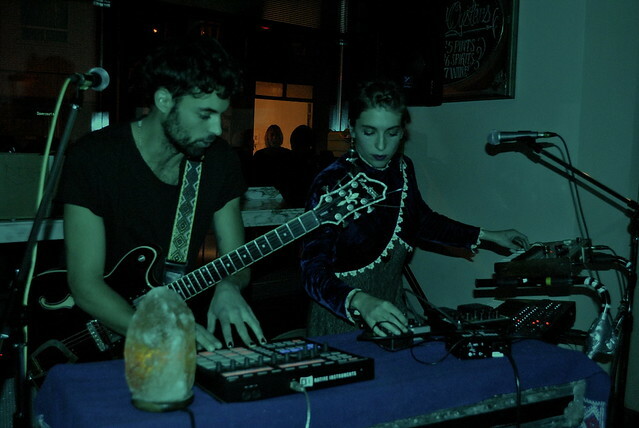 Last for me were Doomsquad – giving the Samuel J. Moore restaurant its first Long Winter performance – playing their new age-evocative electronic music in some cavernous darkness (save for a salt lamp affixed to guitarist Trevor Blumas’ sampling table). The Blumas siblings challenged the physical resilience of the restaurant’s wall-to-wall window with crippling bass, offering only the soft textures of a pan flutes as a possible remedy. From everything I was able to take in before calling it a night, The Great Hall seems properly primed for another season of Long Winter, even with the SJM restaurant added into the chaos (despite the potential for sonic disaster in the new venue, only some quickly resolved mixing issues that initially placed Trevor Blumas’ sampler way too low in the mix presented themselves over the course of the set). And from what I could make of the faces I saw on Friday, I think audiences are ready, too. This entry was posted in Burden of Salt and tagged "Conflict. Resolution. Conflict", art, Ben Kamino, Bidiniband, community, Dave Bidini, doom squad, DOOMSQUAD, Edward Keenan, Esther Grey, Exclaim!, Fucked Up, Godspeed You! 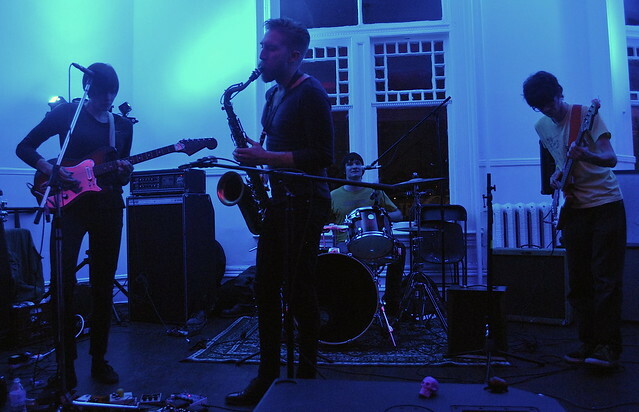 Black Emperor, James Keast, Josh Zucker, Kazoo! Fest, Lido Pimienta, Long Night with Vish Khanna, Long Winter, Matt Kelly, Mike Haliechuk, music, politics, Rob Ford, Samuel J Moore Restaraunt, Scion Sessions, Some Great Idea, The Great Hall, The Grid, Toronto, Vish Khanna, Wake Island, Zaki Ibrahim on November 11, 2013 by Tom Beedham.